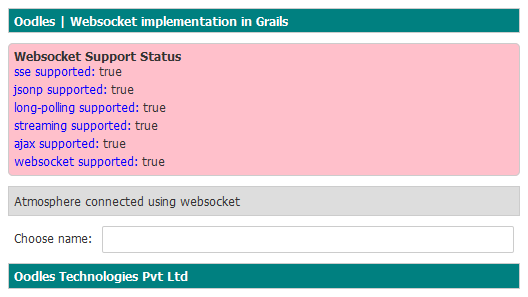 Today I am going to share my findings on how to Integrate websocket in grails using Atmosphere plugin. Initially I just wanted to implement all reverse ajax and server push stuff , so I created a simple servlet based application . Later on I realise that if I could added this in a Grails project than it would be very usefull. After a little effort and a few hour of working I am able to integrate atmosphere with java to take advantage of websocket. I started all this by creating a simple Grails project in STS. Than I added atmosphere plugin to take advantage of its flexible nature. After this I added some code from sample chat app that is given on atmosphere official site and modified the code according to my need. After a number of failure and retry finaly I was able to see expected result. I used STS and the default server in it does not support websocket ,so i was forced to add apache tomcat to sts before I start runing my application. Let me now explain some of code sample and changes that I have implemented to make all this working. Added a simple service to the application that is used to map URL so that js files can attach this to websocket side of code. println "ERROR in onStateChange: $e"
Once everything is configured we can get the application running like something like these screens. In first picture we can check out the status of our server and browser if they support websockts or not . 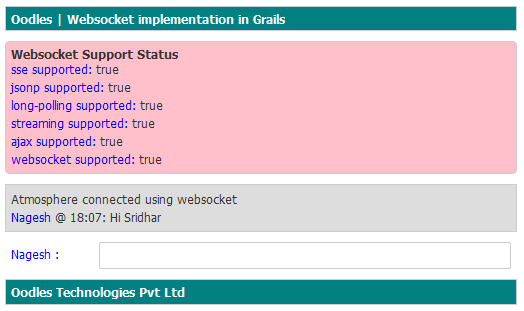 If websocket is supported by the browser than we have to add a name to start chat. The very first value is used as name and after that all other values are used as a message. First a message is send to the server and after that the server pushes that message to all users. In last figure we can see that a user named Sridhar is just online and he receives a message from other user Nagesh . This message is a result of server push only as sridhar does not request any message or data from server. Thats all about server push technology that can be implemented in Grails Projects easily. There are a number of files in a grails project but they all are same and are automatically provided by STS. Here I have added those code files that need to be added explicitly.